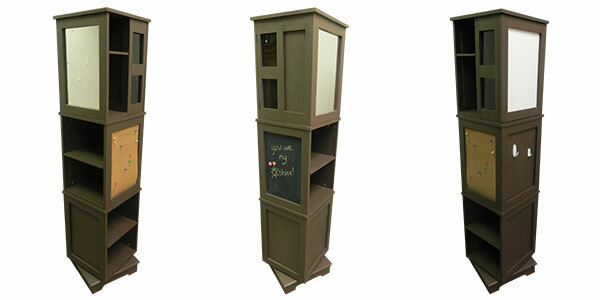 Back in October, I was just starting to design a 360-degree, revolving vertical tower cabinet. When I first approached the design of this product, I was skeptical and not very enthused about the project. But as I got more involved in the design aspect, I became quite intrigued about the overall uniqueness and functionality of the cabinet. After working on the prototype cabinet in most of December and January, between what seemed to be almost non-stop snow removal from my driveway and roof, the final piece is now complete! I am so anxious for the introduction of this new woodworking plan because, more than ever, I think many of my fellow woodworkers are going to want to build one or more of the cabinets. Just as a result of family members seeing the cabinet in my workshop, I have already received requests for two cabinets. One cabinet is to begin in a small child’s bedroom while the other cabinet is going to be put in a kitchen/dining area. The child’s room cabinet is going to feature cabinet insert panels with dry erase white marker boards and chalkboards as fun activity centers. The other cabinet insert panels are going to feature laminated posters of children’s storybook and cartoon characters. Storage areas in the cabinets will be for toys and books, primarily. There has already been considerable discussion about how they will change the cabinet insert panel décor so the cabinet will stay reflect the child’s interest and needs clear through college. The kitchen/dining room cabinet is going to be finished to be a combination message center with dry erase white boards, magnetic chalk boards, cork boards, plus storage space for cookbooks, spices and liqueur cabinet. Although I am most excited about the versatility of the swivel cabinet, I am also very pleased to report that building the cabinet is very affordable and quite easy to build with only modest array of woodworking tools and machinery. I built the prototype for Klockit from pine (dimensional) lumber and birch panel stock, all purchased at our local lumber store. All machining was done using only my table saw, small table router, drill press, and assorted hand tools.